This private tour is aimed at photogenic travelers who would like to visit hidden local gems inaccessible by the large tour busses. You will be picked up at your hotel in Tokyo by a private car and driven to Mt. Fuji Region. 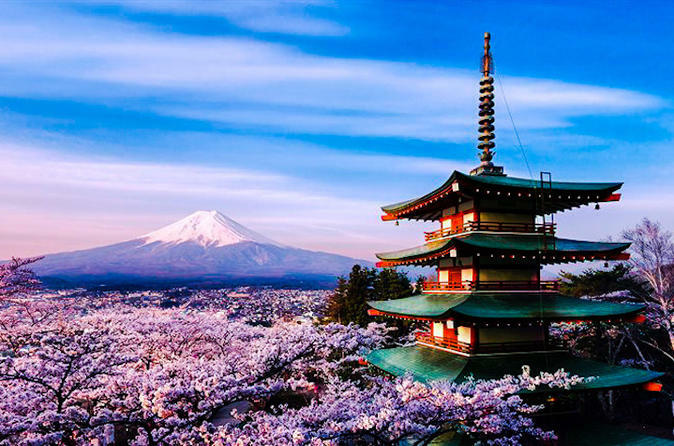 Your first stop is Asama Sengen Shrine where you can have a glimpse of a bright red pagoda with Mt. Fuji in the background. You will then make a visit to The Itchiku Kubota Art Museum that has a vast collection of Mt. Fuji-inspired kimonos. You will enjoy Mt. Fuji from another angle at Lake Kawaguchi, one of the most scenic lakes of the Fuji Five Lakes. You will also enjoy hoto (thick flat noodles in miso soup) at a local restaurant near the lake. The last stop before heading back to Tokyo is a local sake brewery where you can sample a variety of locally produced rice wines. The tour is limited to a maximum of four participants and complimentary Wi-Fi is available throughout the tour so you can share your photos real time with your families and friends back home. Admission to the shrine, museum and sake brewery is included but lunch is at your own expense. Drop-off at Shin-Fuji Station is available with no extra charge for those who are continuing their trip to West Japan such as Kyoto. Please consult with the tour operator on the approximate arrival time and the luggage capacity in the car if you wish to opt for this option.